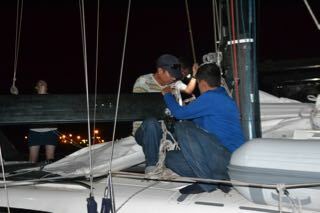 The broken boom was repaired byt the chandlery in Santa Marta. They pormised to deliver it on Monday 18th of January and the start was on Wednesday 20th. No boom on Monday. Ok 12.00 on Tuesday, then 15.00, then 17.00…. 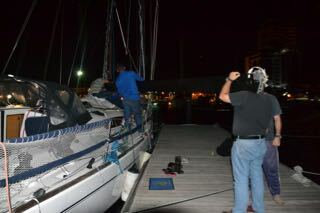 it arrived at 1800 on Tuesday evening, an hour before the Prize Giving Dinner. 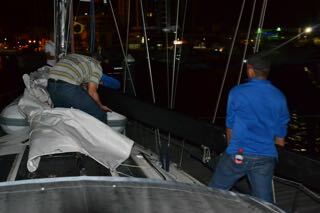 The guys had to work in the dark to get it fixed and Jörgen joined them after the dinner and worked on it until midnight. 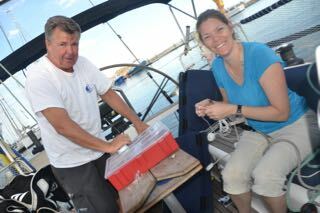 Wednesday early morning Jörgen and Ellen fixed the rest right on time at 10.00 before the start at 12.00. At 11.00 we received the information from Rally Control that the start is postponed to the day after due to too heavy winds and high waves…. The boom, 10 cm shorter, repaired and fixed!